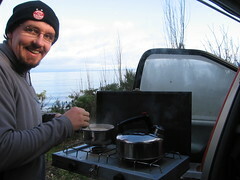 Cooking for ourselves for 3 weeks was a real luxury, even if it was in a camper van with only 2 burners and 3 pots. In between all the eating we did a fair amount of walking and hiking, (and swimming - it's a very cheap way to get clean as well as a bit of exercise) so we didn't quite turn into the flumps you'd expect after that ingredient list. Camping burns lots of calories, that's what I always say. Of course, it´s always worst at breakfast time, which is the meal I have struggled with the most while we´ve been away. It´s not so bad for Athole - he can go till 1230 quite happily without much more than a cup of tea and a biscuit. But if I haven´t been fed by about 10 o´clock, I can become grumpy, unwilling and very, very stroppy. Poor Athole! I think the least inspired breakfast we encountered anywhere was in Russia - pink, wet, limp hot-dog sausages with no skin; boiled to oblivion and then served semi-tepid with a choice of spaghetti or something unidentifiable that may or may not have been semolina or grits. On the side: tasteless cheese and raw onion with bad coffee and tea (8 spoonfuls of sugar obligatory). China wasn´t too bad so long as we were in hotels, although rice porridge with egg is singularly unappealing at 8am. Here in South America it is an unvarying diet of white bread, sticky, incredibly sweet jam, tea, coffee and relentlessly over- or under-cooked eggs. Yoghurt is an option, but it usually consists of sugar, powdered milk (milk dust as Athole calls it) and flavourings and e-numbers. What wouldn´t we give for a Markies fresh fruit greek yoghurt! The worst was definitely Laos though - on our 3 day trek in the jungle we were treated to hand-caught frogs, boiled with land crabs and eels and served in a spicy soup. It is, of course, immensely rude not to try the food in that sort of situation, especially as our guide was the one who had been out at 3am in the fields catching the frogs. Athole and I cautiously nibbled at the legs of the frogs, peeling off the skin (they were boiled whole) and nodding enthusiastically. Meanwhile, our guide casually picked one up and bit its head off, chewing even more enthusiastically. Watching him chomp through the rest of the amphibian whole, we realised we were going to have to eat frog guts for breakfast. Eating the insides of something that lives entirely on flies is never appealing - at 0730 less so, but we both managed a bite or two before putting down our frogs. At which point our guide asked: "Are you finished?" and proceeded to eat our leftovers. Luckily in New Zealand, we were self-catering, although trying to live as cheaply as possible. That meant one thing only for brekkie - porridge. I could eat it every day and not get sick of it, but Athole was ready for some cocoa pops after about 2 weeks. You should have seen his eyes light up when I figured out a way to make toast. Boiled eggs and soldiers was never such a treat! I think our other hardest walk was the Pinnacles, also in the north island, which was really tough - mostly because we had to climb stairs rather than walk alot of the way. The Pinnacles themselves are incredibly high, grey towers of rock, not far from Auckland. We set off to go half way up one of them, and found that the track we were following was originally made for timber-workers who invented a system of pulleys to harvest the enormous Kauri trees that were found in the area. They cut stairs into the rock in order to make the many trips up and down easier going in the rain and mud. We were getting puggled going up with just our daypacks holding water and a few mars bars - these guys must have been made of iron dragging all sorts of heavy equipment and tools up there! (Actually, it turned out they had horses and mules, but still.) Once we had reached the top, we could still see the Pinnacles above us, but it felt as though we were walking through the tops of the forest below, we were so high up. There were many others - the scenery and landscape of NZ makes it impossible to go anywhere without discovering another lovely walk around the corner, and those two were the longest ones we completed. But I think Athole´s favourite was the Rob Roy valley, where we stomped our way up above the tree line in a really narrow valley to reach a mountainside that was just perfect - trees, snow, blue skies again and waterfalls cascading all over the sheer, rising cliff opposite ours. The only thing that was missing was a slug of rusty nail at the top!